This post is sponsored by ©Knudsen & Sons, Inc., all opinions are my own. Sounds good, huh? And smoothie bowls are super easy to make. The key to making them so thick and spoonable (is that a word?) is using all frozen fruit with just enough juice to get things moving in the blender. No ice and never water — a watered down smoothie bowl is SO meh. I use the same basic recipe for all of my smoothie bowls, simply varying the frozen fruit, type of fruit juice, and the toppings to change things up. It’s a virtually foolproof base of 5 simple ingredients that allows you to experiment and have fun with your food. Let’s start with the juice… I always look for 100% juice, which is what R.W. 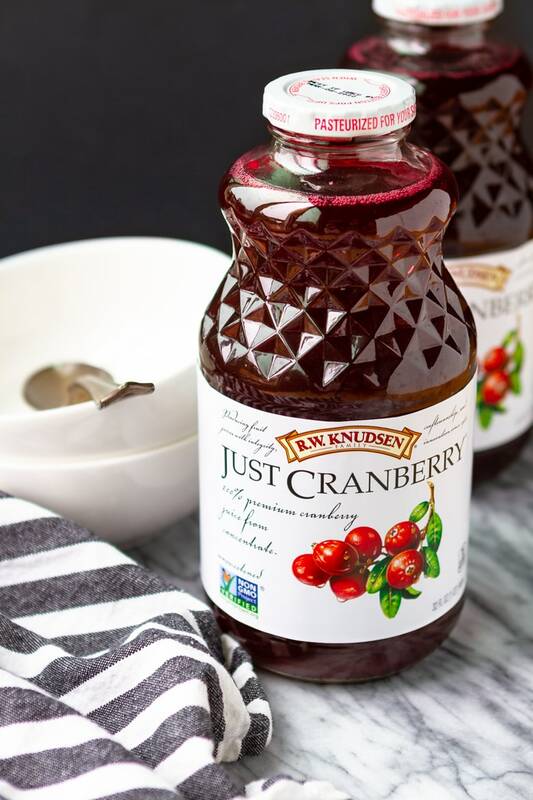 Knudsen Family provides in their line of unsweetened single fruit juices. With varieties like Just Cranberry (my fave! ), Just Pomegranate, and Just Tart Cherry, you know you’re getting the maximum taste for each juice. R.W. Knudsen uses ingredients that are all natural, and each 8-oz. is a full serving of fruit. So I feel good about using it in my smoothies and smoothie bowls AND serving it to my kids! Find it in the juice aisle at Walmart. R.W. Knudsen prides themselves on their all natural ingredients. What exactly does that mean? Well, when we’re talking about cranberries, it means that small farms, like Peters Cranberries in Sixes, Oregon, are water harvesting their cranberries just like they’ve always been. 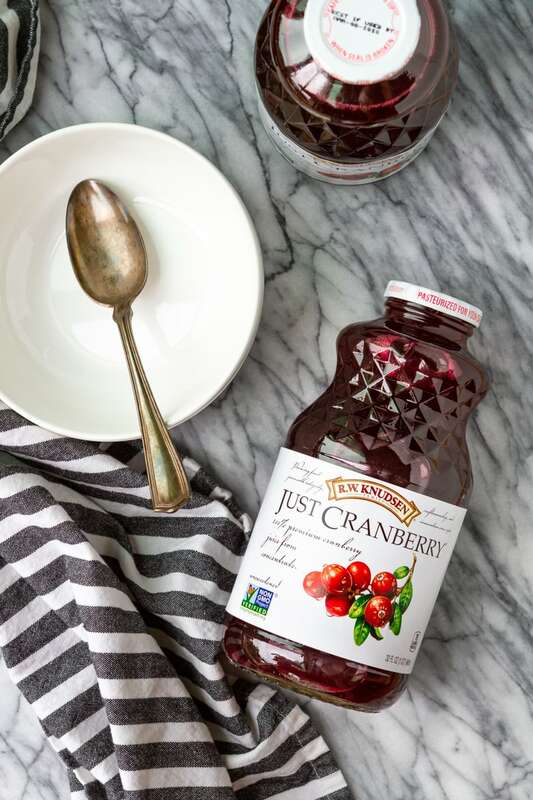 After harvest, their ripe, flavorful fruit is processed into high quality, delicious products, like my favorite Just Cranberry Juice! frozen fruit — use a single fruit or a mixed variety. I like frozen blueberries, strawberries, mango, peaches, and raspberries, among others. plain Greek yogurt — Greek yogurt adds creaminess and protein to your smoothie bowl, while also helping to thicken it up. frozen banana — this is a great way to use up overripe bananas! I freeze them for my smoothie bowls to help thicken them up and add natural sweetness. honey (optional) — sometimes you just need a touch of extra sweetening, and honey is my go-to option. Taste your smoothie bowl without it and add as needed. After your smoothie bowl mix is blended up, the real fun happens. Pour it into a bowl, and top it all off with your favorite mix-ins! Some of my tried and true choices are: fresh fruit, granola, shredded coconut, chia seeds, nuts or nut butters, cocoa powder, and even chocolate chips on occasion. It toed the line between sweet and tart perfectly! I topped it all off with some fresh blueberries, shredded unsweetened coconut, and about a tablespoon of chia seeds. But you don’t have to follow my lead — the possibilities are endless! PIN IT NOW! CLICK HERE TO ADD THIS PERFECT INSTANT POT SWEET POTATOES RECIPE TO YOUR INSTANT POT RECIPES BOARD ON PINTEREST! Combine cranberry juice, frozen blueberries, yogurt, and banana in a blender. Cover with the lid and process until smooth. Taste and add honey to sweeten, as desired. Pour into a small serving bowl. Sprinkle with desired toppings. Suggestions for toppings: fresh fruit, granola, shredded coconut, chia seeds, nuts or nut butters, cocoa powder, or chocolate chips. R.W. Knudsen has been making juices “Just That Simple” Since 1961. Check out more recipes using their juices on their website! I’d love to see how your smoothie bowls turn out… Tag me @Unsophisticook on Instagram or use the hashtag #Unsophisticook so I can check it out. Enjoy! Looks really good. I’m thinking I might try this with Cranberry juice, blueberries, strawberries and some beet root powder. Yummy! I know you would die at the thought of beets but… LOL – I’m so into them! LOL, you’re SO right! But I’m actually going to make myself try it when NOW Foods has it back in stock. 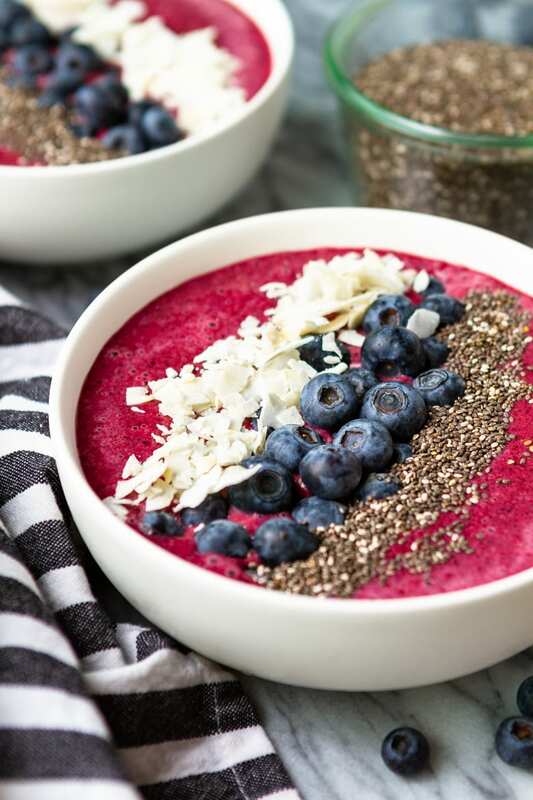 I am all about a good (and flavorful) smoothie bowl and this looks like a winner! Gorgeous photos too! Pinning this one to try, thanks! I have smoothies every day, but can you believe I’ve never tried a smoothie bowl? I never understood what they really were until your great explanation. It makes sense now! I love your GIF too! 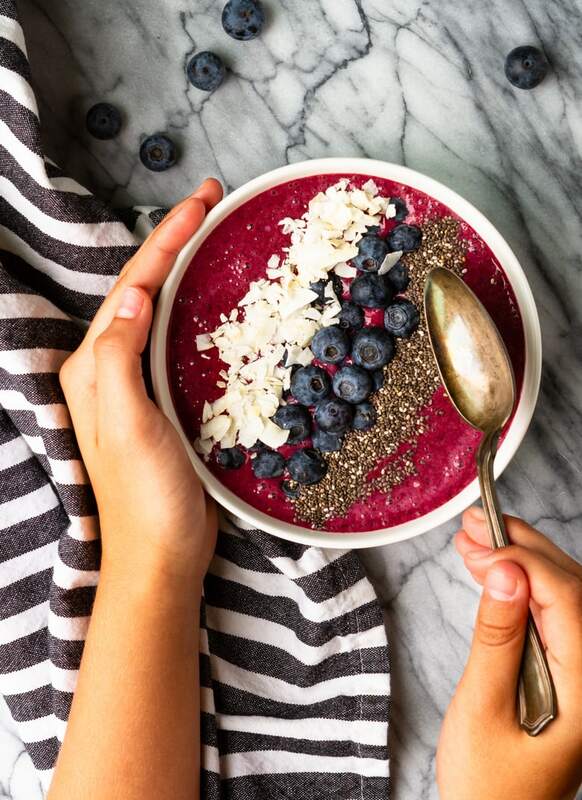 That looks like such a gorgeous smoothie bowl – we are already fans in our house, but I like your tips on how to build your own. I am always looking for new smoothie and smoothie bowl recipes, thank you! I love how easy it is to make to with just 5 ingredients! 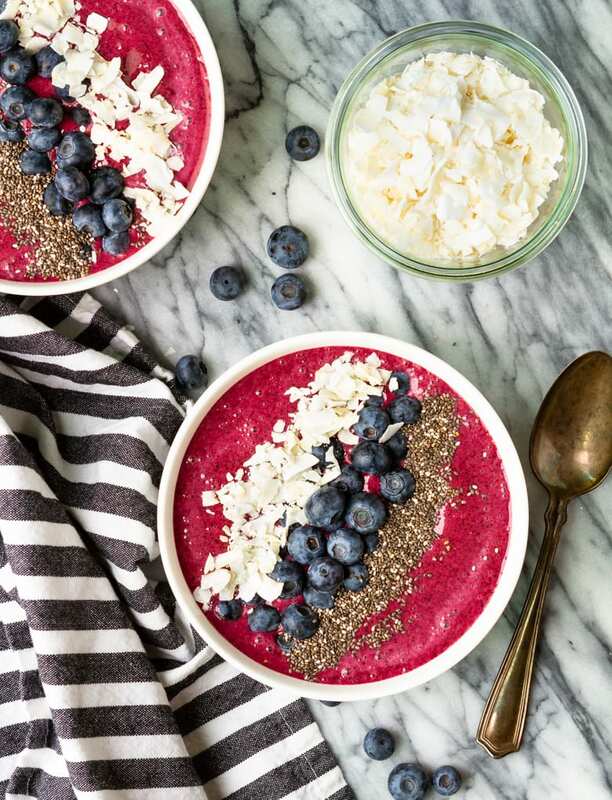 I literally live on smoothie bowls in summer and I’m always looking for new recipes to try, this one looks so delicious! 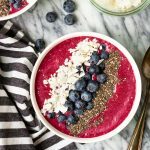 I start every day with the drinking kind of smoothie but your smoothie bowl looks so good, I think I should try smoothie bowls too! What a great idea to use cranberry juice! Acai is so hard to find around here, but I can find cranberry juice! Can’t wait to try this!